Macedonia's Prime Minister Zoran Zaev, speaks at the Western Balkans Summit in London, Britain, July 10, 2018. NATO has officially invited Macedonia to initiate membership talks aimed at having the former Yugoslav republic join the Brussels-based North Atlantic alliance. The long-anticipated invitation was announced shortly after summit meetings involving the heads of states from all 29 member nations. Greece and Macedonia have been feuding over who gets to use the name since Macedonia's independence from Yugoslavia in 1991. Many Greeks say allowing the neighboring country to use the name insults Greek history and implies a claim on the Greek territory also known as Macedonia, a key province in Alexander the Great’s ancient empire. As a result, Greece had blocked Macedonian efforts to join the EU and NATO. Despite recognition by 137 countries, Macedonia is officially known at the U.N. as the Former Yugoslav Republic of Macedonia (FYROM). Last month, the two countries settled their dispute, opening the door for NATO to extend a membership invitation, triggering a round of talks that, if successful, would make Macedonia NATO's 30th member. Protesters take part in a demonstration against the agreement reached by Greece and Macedonia to resolve a dispute over the former Yugoslav republic's name, in Thessaloniki, Greece, June 24, 2018. During discussions at an Atlantic Council forum held on the NATO summit side lines, Macedonian Prime Minister Zoran Zaev said getting to this point required decades of hard work by both nations. A political rift among Macedonia’s 2 million residents, along with members of its global diaspora, had further complicated efforts to resolve the name dispute, and determining precisely what percentage of Macedonians supported resolution of the name dispute depended largely upon who was asked. A 2018 survey by the Skopje-based Institute for Democracy, which is connected to a Brussels-based consortium of NGO's that advocate European integration, said an estimated 61 percent of Macedonians support resolving the name dispute if it expedites EU and NATO membership. On Wednesday, Greece expelled two Russian diplomats over allegations that Moscow has interfered in its negotiations with neighboring Macedonia. Moscow, which sees its influence in the Balkans diminishing, opposes Skopje’s efforts to integrate with Western Europe. 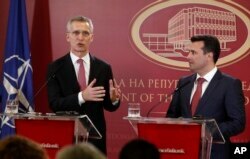 NATO Secretary General Jens Stoltenberg, left, talks for the media during a news conference with Macedonian Prime Minister Zoran Zaev, right, following their meeting at the Government building in Skopje, Macedonia, Jan. 18, 2018. NATO Secretary General Jens Stoltenberg, however, said the option to join the alliance is now exclusively up to the Macedonian people. Clarification: A prior version of this article contained a reference to pro-Russian leanings within the Macedonian opposition that was potentially misleading. VOA regrets the error.